Computer shortcuts enable you to cut even more time when doing various tasks in programs which is key for today’s tech savvy computer user. Nearly everyone knows a few of the more popular ones that are preset on every PC : Ctrl+c to copy, Ctrl+v to paste, etc. They really do save time, and learning how to utilize them efficiently can open doors in computing. While Microsoft and software developers are gracious enough to provide some shortcuts, those provided standard with certain products often fall short of fulfilling our individual needs. Different users want different things to happen when they push certain keys, but the part of the population that knows how to make that happen is limited in some cases. Although you may not realize it, your Windows machine already has the capability of creating custom shortcuts. The funny thing is, you have probably looked right at the option hundreds of times without realizing what it meant. Find an application or file that you would like to assign a shortcut key to. Right click, then select “Create Shortcut,” just like you would if you simply wanted to create a desktop icon for something. A new icon should appear. Next, right click on the new shortcut, then select properties. Select the “Shortcut” tab along the top of the new window and find the field that says “Shortcut key:”. Now click in the box. At this point, any combination of keys that you hold down at the same time will bind to the shortcut. For example, if you click in the field and the hold down Ctrl+Alt+r, pressing those same keys simultaneously while doing anything will open the file or start the program you have bound them do. You can alternatively select a single key to be the shortcut key for the selected file or application. Windows will automatically add the keys Ctrl-Alt to it. Once you have chosen a shortcut key and assigned it in the field, click “Apply” and close the window. Then give it a try. Your short cut keys should function the way that you want them to. For many users this is all the keyboard shortcut customization they need. Others require a bit more structure, wanting to be able to review all their shortcuts on one screen and to assign keys tasks as well. If you are one of those people, you might consider downloading a program like WinHotKey, HotkeyMan or Hoekey. Those programs allow you to bind key combinations that include the Windows Key to do things like minimize and maximize windows in addition to opening files, folders and programs. Perhaps most importantly, they allows you to view all the assignments you have made on one page. That way if you attempt to make a shortcut but can't because it's already assigned, you can look and find out where. There are a few restrictions, and you cannot reassign the Windows Key to do things differently than Microsoft already programmed it to (the Windows Key already does things? Who knew?). But overall, these applications allow you to make some pretty significant improvements. Shortcut keys can shave seconds off the time it take to open windows and files, and while that may not sound like much, over a week, a month, or a year, the increases in productivity those seconds create can be significant. In fact, it saves you time searching as well. These days, anything that increases productivity is a good thing. Are you someone who uses shortcut keys? Are you likely to create your own? the only shortcut i remenber i use is the NirCmd Mute/Unmute Shortcut (nircmd.exe mutesysvolume 2), pinned on the win7 superbar. This doesn’t work for me in XP SP3. I made a shortcut to the calculator and assigned it to CTRL+ALT+C but nothing ever comes up. :( I would love for this to actually work. Skrell have you tried another combination? Maybe that one is reserved by another application? Ok here is what you need to do. The shortcut needs to be placed on the desktop, it is otherwise not working. You also may need to restart the computer or the explorer.exe process. I tried a long long time ago to live with this Windows built-in shortcut hotkey. But I couldn’t “see” them all in a list of any kind besides the one I wrote down. I switched to qliner hotkeys … http://qliner.com/hotkeys/default.htm … one of the then-best visual implementation which also remaps the Ctrl key to a Win key. I used it even after their (?) last update in December 2007 — it was well done enough, I guess, it didn’t need anymore ‘updates’. => HotKeyP… http://petr.lastovicka.sweb.cz/others.html … , the smallest footprint application I’ve found to reduce my keyboard-mouse activity (I’m a writer, grin). Both have been serving me well for years. No icon needed on the desktop (mine is pitch black empty), no NET Framework, no memory overhead, no software conflict. I use the EmergeDesktop shell replacement, it has many built-in utilities which should have been implemented by Microsoft. They also have a hotkeys and launcher modules, but I’m not using them. Their VirtualMonitors app is a god-sent add-on. My two-cents. PS. And no, I do not work for those guys, nor do I profit from saying what I did, unless we’re talking about pure simple satisfaction. jfjb, thank you for the link to the HotKeyP softwre, didn’t know that one. However, I am writing back to tell you about AutoHotkey. It is also open source without .NET overhead and though it is some Kb larger, it can do so much more. 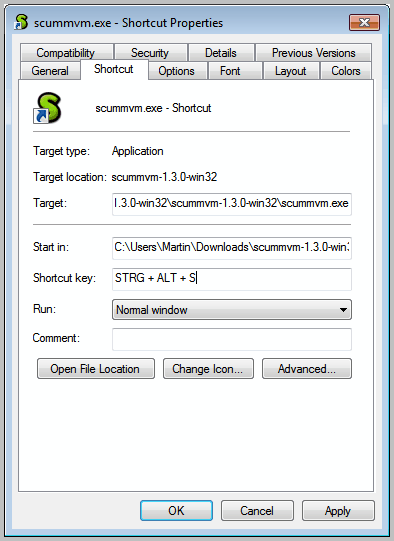 It is a combination of a scripting language (can do all kinds of things like automating Windows, input text, click buttons and so on) and the capability to bind these actions to arbitrary shortcuts, including the Windows Key – and even with the possiblity to override default Windows shortcuts, should you so desire. I write you mainly because you mentioned being a writer: one of the built in functionalities are HotStrings/AutoReplace. whenever you type “j@”, this types out “johndoe@example.com”. It is just like Microsoft Word Autoreplace, except that it works SYSTEMWIDE, in Word just as well as in Excel, Notepad, while renaming files, etc. You can also have different behaviors if you are in a certain application. You could have “j@” type out to “just some long phrase” in Excel and have it mean “journal entry number” in Word. And this snippet here creates a Hotkey for (Windows Key + N) as in “now”. Whenever you press WIN-N, the current date is entered. This works SYSTEMWIDE, in Word just as well when renaming files. The latter is also the reason for the YYYY-MM-DD format – if you prepend a filename with such a datestamp, you can easily sort by name and the files will all be in chronological order. It has a very active community and people have written fantastic software with it. It is one of the few pieces of software which are so versatile and fantastic that really everybody should know about. I discovered this trick ages ago, but I still believe it to be one of the gems of making Windows that more useful. One thing to note though is that you should not move a shortcut after you assign it a shortcut key, otherwise the key assignment breaks. Instead move the shortcut first to the place you want it to be, then assign it the shortcut key you want. Also if a shortcut key fails after assigning it, just clear that shortcut key from the shortcut, save it then assign it again and it should work. One important thing I left out is where the shortcut link can be place for it to use a keyboard shortcut. There are apparently only 2 places where you can keep a shortcut link that will also allow a keyboard shortcut to be used. So those are the 2 places, I have yet to find any other location that works.